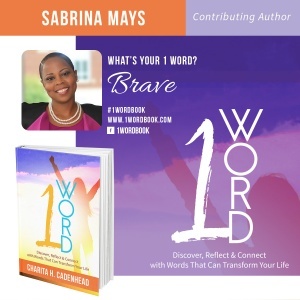 CLICK HERE TO order your AUTOGRAPHED copy of 1 Word: Discover, Refect & Connect With Words That Will Transform Your Life featuring co-author Sabrina Mays. All orders from this page will be personally autographed by me, Sabrina Mays. In this book, 14 authors share one word that has served as a motivating force in their path to personal or professional success. Along with the word, they share a motivational situation about how this word helped to transform their life. While our stories may be different in their own right, our stories connect all of us thought-leaders and positive role models. 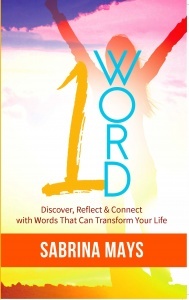 Order you copy today and discover, reflect and connect with words that can transform your life. We take so much for granted these days. As a result, some people, maybe even you, never or rarely take the time to reflect on words that impact their lives. Get the book and then start the journey of self-reflection, digging deep into your own conscience and discover words that have somehow played a significant role in your life without you even knowing it. ABOUT THE AUTHOR: Sabrina Mays is a Birmingham native. She attended Ramsay High School. She earned a BS degree in Justice Sciences from The University of Alabama at Birmingham and a MBA in Human Resource Management from American Intercontinental University. She is a community activist, serves as a board member for Brave, Inc., The Birmingham Public Library Young Professionals Board, Latch and Live Foundation, Traveler’s Aid of Greater Birmingham, and Beyond Boundaries, LLC. She is also secretary for the Birmingham Chapter of The Continental Societies, Inc. Sabrina is a mother of two and the youngest of five of siblings. In 2011, she began Cardiff Retirement Community, Inc., now known as BRAVE, Inc. a nonprofit which serves low income seniors and children by providing creative opportunities to improve their quality of life through healthy initiatives, physical fitness, and nutrition education. During her service, she has assisted over 300 families within Jefferson County, AL by providing meals to low income seniors residing in assisted living facilities and Birmingham, AL metropolitan and homeless shelters.